Pobrać. Do you use a keyobard layout with the Polish diacritics? It's extremely important not to disregard it. Also, the imperfective form (in the infinitive) would be pobierać. 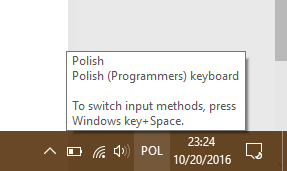 Why does the Windows' Polish keyboard not have the diacritics? I'm furious! What keyboard do you use? there are two Polish keyboards- typewriter's=maszynistki(214) and programmer's = programisty. Use programisty- it has most diactetics under right alt+letter, and ź R.Alt+x. Take care, that you´ve selected the correct language in the IME bar, when you want to write in the desired language (i. e. "DE" for German, "JP" for Japanese, "EN" for English and "PL" for Polish and so on, see https://docs.oracle.com/cd/E13214_01/wli/docs92/xref/xqisocodes.html). And the desired program or application where you want to use another language should be in the focus, because the language setting may change/reset to default if you switch to another program (ie. Word/Browser). I'm assuming that this phrase is found on internet pages; but could you not also assume a "ty" before it thereby suggesting the interpretation "You download the file"? Well, even in English in the imperative mood you rather don't put the pronoun explicitly, and in Polish it also sounds strange. This is just an unusual emphasis: "YOU download the file! I will not do it!"